Consumers rely on SmartPay, Better Finance, Inc.‘s lease-to-own payment plan, to get smartphones, accessories and other high-value items. SmartPay spreads the payments over an extended term to make them more affordable. Working with leading wireless carriers and retailers, SmartPay lease-to-own is offered directly in their and on retail websites, with no technical integration required. Consumers easily apply through an online or mobile application to get an instant decision. If approved, scheduled payments are timed to each consumer’s pay cycle to make automatic payment easy. 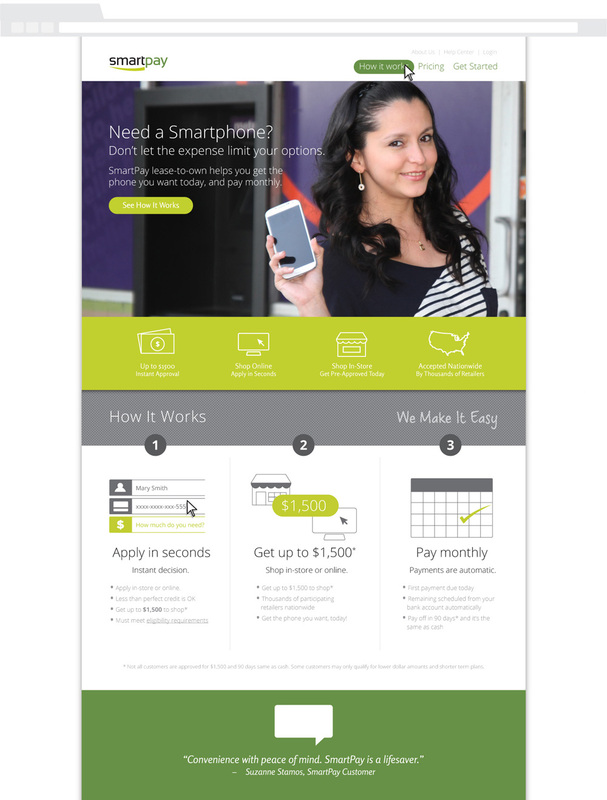 An increasing number of SmartPay’s customers are using their phones to interact with the web. Coupled with the fact that SmartPay aims to reach customers on the spot in brick-and-mortar retailers, it was imperative that the SmartPay website be responsive, performant, and easy to use on mobile devices. Designs were developed “Mobile First” to ensure no essential parts had to be left out when the page scaled down to phone width. This naturally led to a clean, bold desktop version of the site that is highly legible and gets to the point across quickly and clearly with oversize typography, bold pop colors and full-color commissioned photography. The finished site uses in-page scrolls and off-canvas methods to gracefully stack as the browser width gets smaller, while allowing easy navigability on-the-go. The site was developed by Better Finance’s in-house engineering team, so clear communication surrounding the final design intent was key, especially for the more complex mobile behaviors of the site. Spindle Desco provided a style guide that dictates measurements, colors, and key typographic styles for each page template, in addition to detailed behavior notes and stateful mocks.